These babies deserve a Product review. 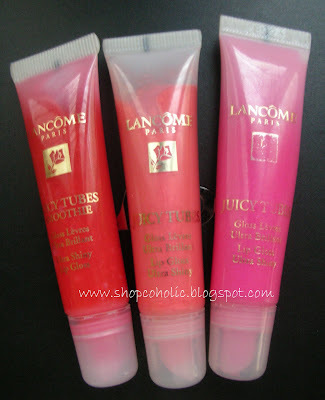 Lancome JT is my one of my fave lipgloss brand. A delicious, gourmet delight for your lips! This ultra-brilliant, flavoured gloss slicks on easily, thanks to its handy tube-tip applicator. Totally transparent shine, plus a hint of shimmering colour makes lips glisten for a glamorous lacquered effect. Can be worn alone or layered with your lipstick. Not for now. Still have a lot of lipglos tubes to finish. i never tried this.. but yeah , most lip gloss problems i encounter is ending up the same color on my lips. I'ts all shiny.. no color..
PS: i went to chains in BTC, one stall sells NYX, but few products. i guess you know it already. they are the same stall owner as WHite Gold's. the whilte gold SA informed me this cos i kept insisting for a discount! and chains in Banawa also, i think in Paseo .. Happy 26th birthday dear Shen! Mio, a little boy who needs help!